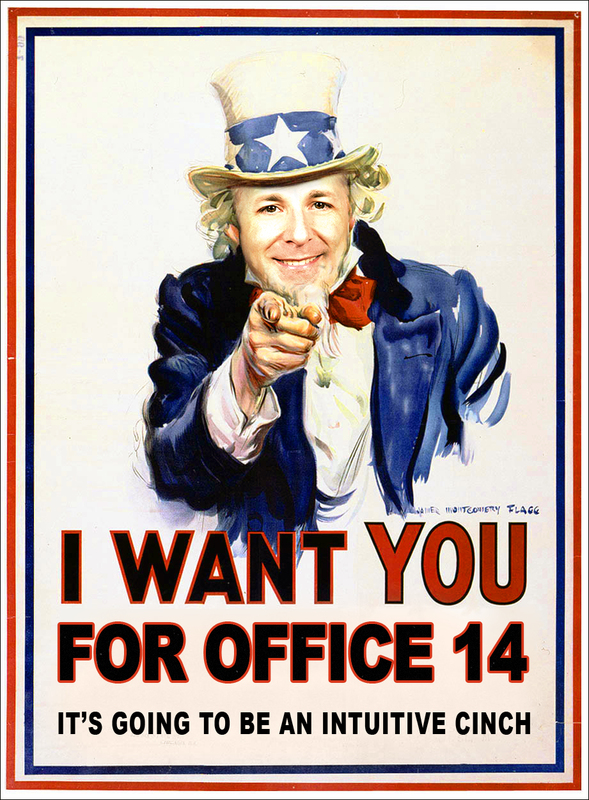 I want you for Office 14. I want you for Windows 7. Backed by popular demand, here are two special edition print-quality “I want you” posters for the next versions of Office and Windows that Microsoft aren’t willing to talk about. Dedicated to Steve Sinofsky – godfather of NDAs. P.S. Happy easter everybody. Stay safe on the roads/plane/super-yacht, whatever you preferred method of transportation is. Don’t think it’s as much about NDAs (non-disclosure agreements) as pure non-disclosure. It’s not that someone is getting The God Oil but not being allowed to talk about it yet — we’ll see that a few years’ down the track — but Sinofsky just doesn’t want ANYONE from Microsoft talking about it now. And I gotta say, I agree with him – sheesh, these are ~very~ early days for both products. And there are more than enough bloggers and analysts and pundits and commentators to speculate as is, without the ‘Softies throwing any wood onto the pile. The Office 12 program was my third Office beta. It was without question the coolest betas in which I participated because of the creativity that went into the architecture. With a good bit of work, a terrific new product resulted. NDA’s however remain the same and that is simply because other nations have a decided interest in NOT protecting IP. That is changing some in China and more so in India. Elsewhere, things are still up for grabs and US firms lose.